Mission San Fernando was the seventeenth Spanish mission built in California. It was founded on September 8, 1797, by Father Fermin Lasuen. The name San Fernando de Espana was to honor Saint Ferdinand III, King of Spain. Many travelers stopped at the mission. There were so many that the fathers kept adding onto the convento wing to accommodate them. The hospice (hotel) became known as the "long building" of the El Camino Real. Actor Bob Hope is buried in the mission cemetery. Where Is Mission San Fernando Located? Mission San Fernando is at 15151 San Fernando Mission Blvd.in Mission Hills, CA. For current hours, visit the mission website. The Spanish first discovered the San Fernando Valley in 1769. In the late 1790s, Father Lasuen, successor to Father Serra, wanted to close the gaps in the El Camino Real. In 1797, he established four missions in four months, including San Fernando Mission. Francisco Reyes, mayor of the Los Angeles pueblo, owned the best land in the area. He got rights to the property shortly after Los Angeles was founded, and he raised cattle there. Some historians say Reyes got his land from the king and he was thrown off it. Others say he had only been using the land and gave it up gracefully. The San Fernando Mission was founded on September 8, 1797, and named for Saint Ferdinand III, King of Spain in the 1200s. Five Indian boys and five Indian girls were baptized at the San Fernando Mission that day. The San Fernando Mission church was completed within two months after the dedication, and by then, more than 40 neophytes lived there. Because it was so close to the Los Angeles pueblo, there was a market for the mission's goods. Its location close to Los Angeles and on a favorite traveling route made it unique. By 1804, nearly 1,000 Indians lived at San Fernando Mission. By 1806, they were raising cattle and producing hides, leather goods, tallow, and cloth. In 1810, work began on the convento (priest's residence). It took twelve years to complete it. After 1811, the native population began to decline, and productivity was threatened. By 1812, there were not enough workers to farm the produce required for the military in Los Angeles. When an earthquake damaged the buildings in 1812, there were not enough people to do the repairs. Mexico gained independence from Spain in 1822. In the California province, people fought to control the mission land. A few Indians in the valley received land grants, but most of the surviving Indians remained dependent on the San Fernando Mission. When Mexican Governor Echeandia arrived in 1827, Spanish Father Ibarra was in charge. Ibarra refused to give up his allegiance to Spain, but the Mexican government let him stay there because they couldn't find anyone else to run the operations. Starting in the 1830s, the California officials began taking over mission lands. They usually left the buildings under the control of the church. From 1834 to 1836, most of the Indians stayed. The rest of them looked for work in Los Angeles or joined relatives and friends who were still living in the nearby hills. In 1835, Father Ibarra left because he could not tolerate the secularization. In 1842, gold was discovered on a nearby ranch. Prospectors overran the area. A rumor that the missionaries had been prospecting gold for years drew prospector to the church. They dug up the floor looking for buried treasure. The fight between northern and southern Californians to control the land got worse. In February 1845, two armed groups met at the Cahuenga Pass between the San Fernando Valley and Los Angeles. They shot at each other for half a day, but the only casualties were two horses and a wounded mule. The northerners gave up and left. In 1845, Governor Pio Pico leased the land to his brother Andres for $1,200 a year. The San Fernando Mission was abandoned in 1847. From 1857 to 1861, part of it was a stagecoach station. By 1888, the hospice was used as a warehouse and stable, and in 1896, the quadrangle became a hog farm. In 1896, Charles Fletcher Lummis began a campaign to reclaim the property, and conditions improved. 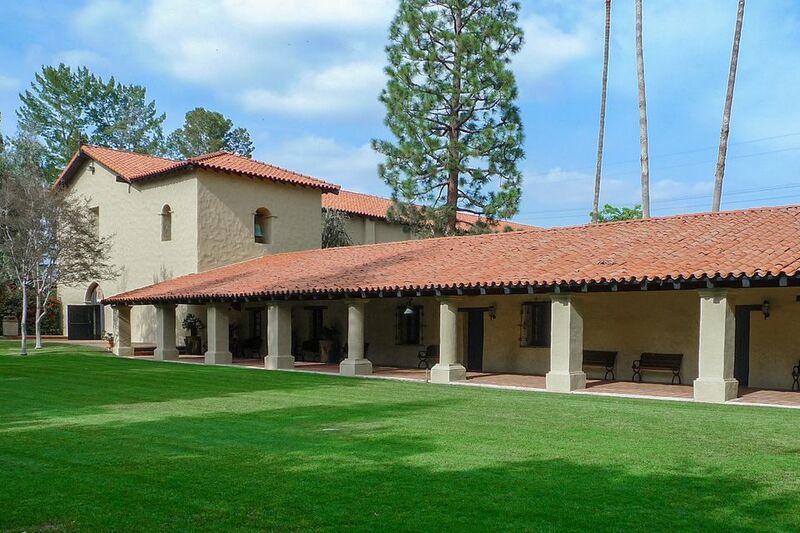 In 1923, San Fernando Mission became a church again, and the property was turned over to the Oblate Fathers. Mission artifacts, including the soap works, original fountain and water reservoir are now in a park across the street. Today, because San Fernando Mission is close to Hollywood, it has been used for many movie location shootings. The mission quickly outgrew its first small church and soon barracks, housing for 1,000 neophytes, workshops, and storerooms surrounded the quadrangle. The buildings had tile roofs. The church is 185 feet long and 35 feet wide. The walls taper from five feet thick at the base to three feet thick at the top. The original convento was completed in 1822. U. S. Army Colonel John C. Fremont used it in 1847 when his army came to California to take it over from the Spanish. Many people visited the mission. To give them places to stay, the convento was enlarged. It became the largest adobe structure in California at that time, two stories high, 243 feet long and 50 feet wide, with 20 arches in front. In 1812 and earthquake damaged the church, but sturdy repairs were made. The building would have stood for a long time, but vandals removed the roof tiles, leaving the adobe walls (which are made of mud) to be destroyed by rains. People also kept digging up the floor looking for gold into the early 1900s. Restoration began in 1923, but the buildings were irreparably damaged in an earthquake in 1971. Exact replicas were constructed to replace them. The most successful year at San Fernando Mission was 1819, and they had 13,000 cattle and 8,000 sheep. Their herd of 2,300 horses was the third largest of any mission. The Mission San Fernando picture above shows its cattle brand. It was drawn from samples on display at Mission San Francisco Solano and Mission San Antonio. This mission is an exact replica, rebuilt after an earthquake. California's first bishop, Francisco García Diego y Moreno, lived at the San Fernando convento from 1820 to 1835.